Freshen breath with these sugar free mints packed with sparkling coolmint flavor crystals. Enjoy crisp, smooth flavor with 30% fewer calories than mints with added sugar. Keep a container in the car, a pocket, or a drawer for instant minty refreshment anytime. 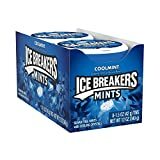 Sugar free ICE BREAKERS Mints contain natural and artificial flavors. Each compact container of mints stays closed with a handy snap-close lid that dispenses just one mint or several at a time. This product ships as 1.5-ounce containers in a pack of 8.